Natasha is special. Health-wise, she has been through it all!! Born with a hole in her heart, she had open-heart surgery at the young age of five and a half years old. Into her teens and twenties she had one serious health problem after another including a rare bone disease in her hip, pre-cancer of the cervix, and Poly Cystic Ovarian Syndrome (to name a few!). 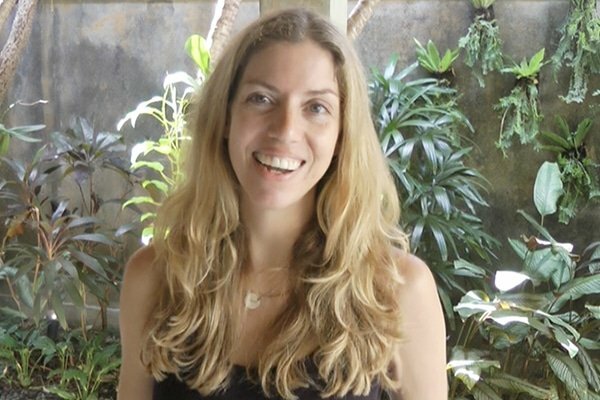 Some may look at Natasha's health history as ‘bad luck,' but to Natasha it was an opportunity to use non-traditional healing methods and nutrition to show the world that you can heal yourself naturally. As a skin care company, we know that acne is complicated. Natasha is sharing with you these 3 things you can change about your daily habits in order to drastically improve acne, no matter what your age. You’re working so hard to clear up your acne – eating healthier, taking dairy and sugar out of your diet. But still, your breakouts haven’t completely cleared up yet, your skin might still be irritated, and you’re understandably frustrated. Here are 3 simple, yet effective steps you can start doing today that will decrease skin irritation from acne, and support the healing of your skin. I have a question for you: How many times a day you use bathroom towels to dry your face? You probably use a towel to dry your face after washing your face in the morning and evening. You might even dry your face again after taking a shower. If you exercise, you probably use a towel regularly to dry your face during intense workouts. In the course of a day, you can potentially be rubbing towels on your face 2 to 10 times a day, or more! And, the towels you’re using, are they always freshly washed, or are some of them hanging in your bathroom, and used over and over again in between washes? (I think you know where I’m going with this). 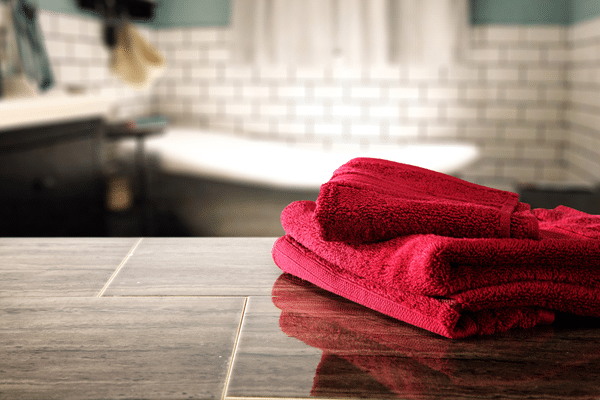 Towels, especially damp or used towels harbor a lot of bacteria. This is the worst for acne prone skin. Even worse are towels that have been washed with strong detergents and bleaches because residues and fragrances from detergents often linger and coat fabrics, causing skin irritation and sensitivity, especially if you’ve got acne or breakouts. The two combined – using towels washed with harsh detergents and bleaches, and towels that are used over and over again in between washes; isn’t doing your skin any favors. It’s probably making your acne worse. So, instead of using towels to dry your face, I recommend allowing your skin to air dry after washing or showering. When you’re exercising, try refraining from constantly drying your face with a towel, and instead, let your sweat evaporate on it’s own (it may sound gross, but you’ll be amazed just how much this can help your skin). If you can’t live without your gym towel, bring your own freshly cleaned towel. Don’t use the gym’s towels (most gyms wash their towels with heavy duty industrial strength detergents, which are much too harsh for your sensitive acne prone skin). Whatever you do, the fewer things touching your face, the better. You will notice that this one step alone will significantly diminish skin redness, irritation, and sensitivity while allowing your breakouts and acne to heal faster. What about using washcloths or muslins to wash your face? They’re fine to use as long as you use a fresh washcloth or muslin every time you wash your face. They must be washed and dried after every use (not just rinsed out and lying around your bathroom). And never wash them with bleach or harsh detergents (I recommend using a fragrance-free, eco laundry detergent). And remember, after washing your face with a clean washcloth, don’t go patting your face dry with your dirty bath towel! There’s a big difference between the water you use to gently wash and rinse your face over the sink, and the water jetting out of your shower head. High pressure water is known to cause microscopic tears in your skin, and if it’s hot water, and spraying on your skin for long periods of time; that’s going to strip your skin of its natural oils and aggravate acne and breakouts. I know it’s much easier to shower and wash your face at the same time, but it's not worth the serious damage it can do to the delicate skin on your face. The best approach is to wash your face gently over the sink and wash the rest of your body in the shower. If possible, avoid getting shower water on your face (if you’ve already washed your face over the sink, there’s no need to be rinsing it again in the shower — you’ll just irritate and dry out your skin more). In all, water in small amounts can be therapeutic for your skin. But if you use too much, or it’s too hot, or too strong; it will irritate your breakouts, cause dryness, broken capillaries, and make it much harder for your skin to heal. If you've been trying to heal your acne, you're probably well aware that there are a bunch of ingredients in skin care products that can clog your pores and aggravate breakouts. What you might have overlooked is that your hair care and styling products are always making their way onto your face, and they tend to have ingredients that do not a clear complexion make. When you wash your hair, when you sweat, or when your hair touches your face — there are countless opportunities for these products to come into contact with your skin. So one way or another, you must be as diligent with using acne-safe hair care products as you are with selecting your skin care products. Two ingredients I recommend avoiding are silicones and mineral oils. Not only do they clog pores and irritate your skin, but they easily build-up on the surface of your hair and skin, and attract oil and dirt. You may have been watching out for these ingredients in your skin care products, but make sure to also avoid them in your hair care products as well. If you know other ingredients that give you pimples and breakouts, make sure they’re not in your shampoo, conditioner, hair masks, pomades, hair oils, and styling products either. We can agree that the fewer irritants and pore clogging ingredients you come into contact with, the better! Want more tips on how to clear up adult acne naturally? Join Natasha’s FREE Acne Solutions 5-Day Email Course and discover 5 most effective diet and skin care strategies for clearer skin in 2 weeks or less! Click here to get started now. theek ah, nai tondi garm paani naal. Thankyou so much! Now i know that using shower is the reason why my pimples haven’t heal with the home remedies and skin care product that i am using.Since it was been healed before at the time that i am not using shower and then i thought shower is the best because less using of hands through off to my faces. Huhuhu im blessed because i have read your article/site and from now on ill try to avoid using bath towels and SHOWER! and i’ll givr my feedbacks again afterwards for its result! Thankyou so much it really helps. Good post! I have always used a fresh washcloth each time I wash my face. And I’m definitely aware of the problems with some hair care products. Many, many years ago I had terrible breakouts on my forehead that I finally traced to a new mousse that I was using. I never even thought about the pressure from the shower head. Thanks for the info! Thank you! Just shared this on Facebook. I’m guilty of reusing towels to wash my face; stopping as of today!! !